New NIST traceable twin-target artifact developed through collaborative approach definitively confirms the accuracy of Leica ScanStation laser scans at the scene of forensic investigations. The new Leica Geosystems validation tool is designed specifically to help crime scene investigators perform the interim checks that are required by ISO 17025 standards. We are pleased to have NIST acknowledge Leica Geosystems' contribution to improving forensics. Today Leica Geosystems announced the introduction of a new quality assurance tool that has been recognized by the U.S. National Institute of Standards and Technology (NIST) as leading to improved forensics. Created specifically for use with the Leica ScanStation PS20 3D laser scanner, the new Leica Geosystems NIST traceable twin-target artifact definitively confirms the accuracy of Leica ScanStation laser scans while at the scene of forensic investigations. 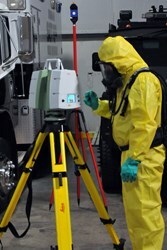 In an article published on its website, NIST cited its close collaboration with Leica Geosystems in the development of this tool and noted the pressure building within the forensics community to have crime laboratories and/or stand-alone crime scene units in the United States adhere to specific standards in their services which require traceability to the International System of Units (SI). For more information about public safety solutions from Leica Geosystems, visit psg.leica-geosystems.us. Those who use Leica Geosystems products every day trust them for their dependability, the value they deliver, and the superior customer support. Based in Heerbrugg, Switzerland, Leica Geosystems is a global company with tens of thousands of customers supported by more than 3,500 employees in 28 countries and hundreds of partners located in more than 120 countries around the world. Leica Geosystems is part of Hexagon, a leading global provider of design, measurement and visualization technologies that enable customers to design, measure and position objects, and process and present data.